The ribbon is cut at the grand opening of the new connector trail for LOST. 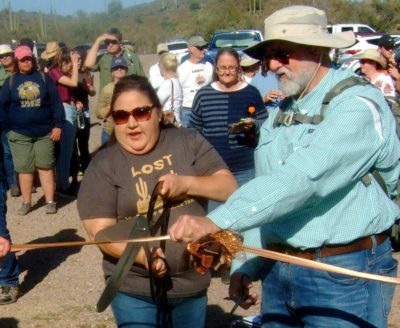 More than 100 people gathered at the Picket Post trail head on Sunday morning for a ribbon cutting celebration and hike on the newest segment of the Legends of Superior Trails. In 2011, the LOST had opened the first Gateway Community Connector trail connecting the Arizona National Scenic Trail to the Town of Superior. That trail alignment was closed in 2015 when the Arizona Department of Transportation expanded the US 60. Fortunately the highway expansion provided mitigation funding for building a new Gateway Community Trail to Superior. It took the LOST, ADOT and the Tonto National Forest a bit of time to find the perfect trail alignment and after a few assessments and many meetings, it was determined that building the trail through Arnett Canyon would be the best alignment, not only for access but also for long term preservation of the natural environment and recreation in the canyon. In 2017 the Tonto National Forest approved an environmental assessment to build the trail and then American Conservation Experiences (ACE) began constructing the trail. ACE employs young adults from across America as Americorp volunteers. They travel throughout the western United States working on trails and other outdoor projects. 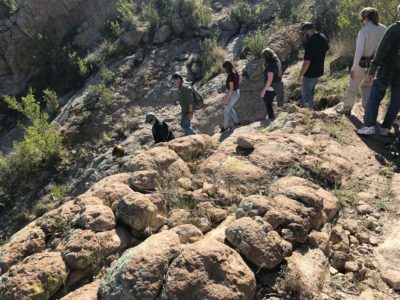 These young adults aligned and built the Arnett Canyon segment to withstand flooding, limit times that trail users have to cross the creek and created a better accessibility into the canyon by cutting steps into the rock. The LOST-Arnett Canyon segment is a six mile hike that travels from Picket Post Trailhead to the Superior Airport. Hiking on the new Arnett Trail segment of the LOST.